1997-2002 4WD Ford Expedition Air To Coil Spring Conversion Kit With Air Lift Load Leveling Kit is the perfect solution to your air suspension problems. Designed to be very affordable, you can convert your air suspension to use standard shocks/struts and coil springs for less than the price of replacing one air strut. The Front Shocks Are Part Of the Air System. If they Are Not Changed Out, Poor Handling, And Excessive Tire and Suspension Wear Can Result. 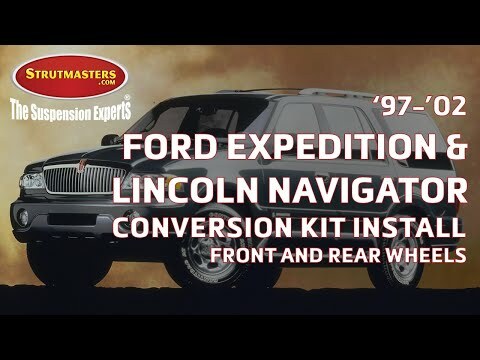 1997-2002 Ford Expedition Rear Load Leveling Air Suspension Conversion Kit 4WD (FX1R0J) is the perfect solution to your air suspension problems. Designed to be very affordable, you can convert your air suspension to use standard. The original air suspension system on the 97-02 Ford Expedition is made up of a variety of assorted parts that must function in sync, or else the entire system stops working. This can result in costly trips to the Ford dealership for suspension repair and replacement. That is not sustainable, and also inconvenient. So we built the FX1R0J air to non-air suspension conversion kit specifically for this model. The kit includes two rear Eibach springs, one Air Lift 1000 Load Leveling kit, and one Air Lift manual control air compressor. The parts are high quality- we offer the only kit on the market using cold-wound steel Eibach springs. Designed for the DIYer, the kit is installed easily in about one hour per wheel. Frustration and wasted time will be gone for good. But the low price is what convinces most of our customers to switch over when choosing between an air vs non-air suspension system. 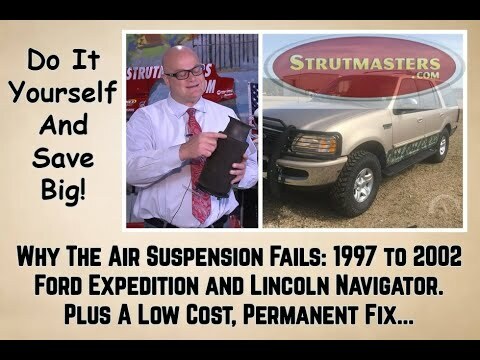 Look at our price comparisons between three different options: that of repairing the air suspension system at the Ford dealer, that of installing aftermarket air suspension parts on your Expedition piece-by-piece, and that of eliminating the faulty air ride headache forever and installing a Strutmasters air to non-air suspension conversion kit today. Some signs of a failed or leaking air suspension system on your 1997-2002 Ford Expedition are more obvious than others. For example, visible cracks in the rear air springs (caused by dry rot) indicate a problem and need replacement. Also, a loud and noisy air suspension compressor (becomes noisy when overworked from running longer than 15-20 seconds at a time) may point to a leaking air suspension system. An illuminated suspension warning light on the instrument panel is one of the most noticeable red flags. But an improper ride height can be subtle or obvious, with both cases pointing to a bad air suspension system. When there is a major height difference between the front and rear end of the Expedition, it can look like the vehicle is squatting or sagging low to the ground. One side may remain inflated so that it looks like there is a shifting lean. Typically, with the Expedition, the rear suspension fails first. If you notice any of these signs, you want to get the suspension fixed before total failure sets in and the other vehicle components wear out. Your options- direct replacement, repair, and replacement- are not all equal. It‚Äôs important to do thorough research. View our comparisons below. 1997-2002 Ford Expedition 4WD Air Springs (x2)- commonly referred to as air bags, a plastic and rubber bag that is fitted on top of the strut that uses pressurized air as a cushion instead of a metal coil spring to hold a vehicle off of the ground and off of its wheels. These are the number one cause of all air suspension leaks. All air springs all go bad at about the same rate. If one is leaking, the others will not be far behind. For a proper repair, all of them need to be replaced at the same time. 1997-2002 Ford Expedition 4WD Coil Springs (x2)- Coil springs hold the vehicle up but be careful, they are rated for and designed to work with the rest of the suspension system, so when you change air shocks to passive shocks, then you will need a different rated coil spring that works well with the new type of shocks. 1997-2002 Ford Expedition 4WD Rear Gas Shocks (x2)- a type of shock absorber; has metal tubing filled with gas-charged hydraulic fluid that is connected to the wheel of a vehicle in order to reduce the effects of vertical travel on a rough surface which controls the bounciness, and therefore comfort, of a vehicle. ; the air spring assembled on top of the strut is commonly referred to as an air strut. 1997-2002 Ford Expedition 4WD Air Lines- tubes that run from a compressor (air suspension) to the air struts which carry pressurized air to the air bags components in order to adjust the height of the vehicle, respectively. 1997-2002 Ford Expedition 4WD Solenoids (x4)- This vehicle is equipped with 4 solenoids. These plastic components connect the electrical connection and lines of suspension components to the suspension control module. The solenoids are responsible for regulating the air pressure in each air spring or air shock. Solenoids are a small piece of the suspension system but they play a big role in how well it functions. If a solenoid is not working properly, it will cause the vehicle to be unlevel and, in turn, cause the compressor to burn out. 1997-2002 Ford Expedition 4WD Compressor- This vehicle is equipped with one air suspension compressor. The compressor is responsible for pumping up the air springs and shocks. When the air suspension starts leaking, the compressor is forced to run continuously to try and keep the air springs inflated. After a couple of days of running non-stop, the compressor will burn itself out. Replacing the compressor is a timely and expensive project to undertake. 1997-2002 Ford Expedition 4WD Dryer Assembly- This vehicle is equipped with a dryer assembly. The dryer assembly is responsible for getting moisture out of the air lines. Once the air suspension parts start to leak, moisture will build up throughout the air system. Moisture damages the air suspension components from the inside out. The dryer must be replaced whenever the compressor is replaced to prevent further damage. 1997-2002 Ford Expedition 4WD Suspension Control Module- This vehicle is equipped with a suspension control module. This module is the brain of the suspension system and it reads all of the signals that are being sent by the height sensors and determines if the vehicle needs to be raised or lowered. 1997-2002 Ford Expedition 4WD O-rings- Although they are the least expensive parts of the air suspension, they are responsible for maintaining the seal where all of the air lines connect. Be sure to replace the O-rings when repairing any air suspension system.